Reminder: Morning Duty Begins at 7:20 a.m.
Wednesday: 5th to Pine Cove. GISD Elementary Art Show begins. Thursday: Alex out until 1pm. Baby Shower for Verushcka. Elementary Art Show Reception 6pm. Friday: Grade Level PLC's- First look at Data Binders with iTeam and Megan Frankenburg. I am providing everyone with a binder and tabs. Yolanda and Maria- You will be missed so much!! 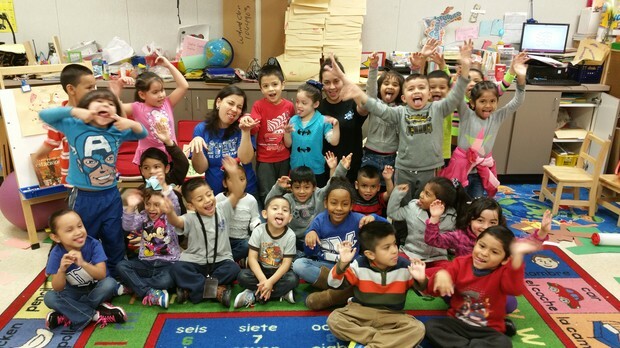 As you all read in my email and have gathered throughout the day...Our pre-k section has been cut for next year and along with it our wonderful YOLANDA and MARIA!!! None of us have the words to express how devastating this is for our school family! However, we all know that things happen for a reason, even if it doesn't make sense initially. They will always be a part of our family and will always be welcome at Walnut Glen Academy!! The two videos that follow show how much our Pre-K students love their teachers and how much Yolanda and Maria love them! You can feel how loved and secure the kids feel! It warms my heart to see this type of relationship between teachers and students!! *They are so adorable that I couldn't help but laughing... Simply precious! Yolanda and Maria did not know that I was video taping them, but after you see the videos, you will be glad I did! Enjoy!! The second grade teachers and Ms. Davis did an amazing job with their program! Thank you for all of the hard work! This is my favorite song! Health Tip- Salad in a Jar! This idea is sooooo easy to make and they keep for about 3 days. There are also options to have the dressing in a small cup above the salad so that it does not mix until you are ready. You can add chicken, potatoes, beans, veggies, fruits....you name it. You are only limited by your own imagination. I bought the jars at Walmart, 9 for $12. This idea is all over Youtube, Pinterest, Facebook and other social media. I want to start sharing healthy tips/ideas. If you have a healthy tip that you would like to share, send me the video or pics through email or on a flash drive so that I can showcase it.